Performing a unique blend of jazz, folk, rock and blues, Beverly-based, rootsy, rockin & blue, the Bob Kramer Trio delivers high-spirited and enthusiastic performances every time they play. Their lively sets are extensive with songs for any age that range from the blues of the Delta to the classic to the Jazz of the streets to their own tasty originals. The Bob Kramer Trio is acoustic and sometimes performs with a percussionist and organ. The Bob Kramer Trio includes: Bob Kramer a seasoned performer and multi-instrumentalist whose love for the Delta and Piedmont styles resonates through his energetic playing and his rootsy singing, Cynthia Keefe whose vocals range from rare and subtle beauty to high-powered and sweet, and Al Foucault rounds out the soul of the group with his steamy vocals and bass. The Bob Kramer Trio perform using a variety of instruments to produce their jazzy folk/blues original sound, including slide guitar, mandolin, and other guitars. We also perform as a quartet (percussion) and 5 piece electric band (organ/keyboards). You can view past performances here. 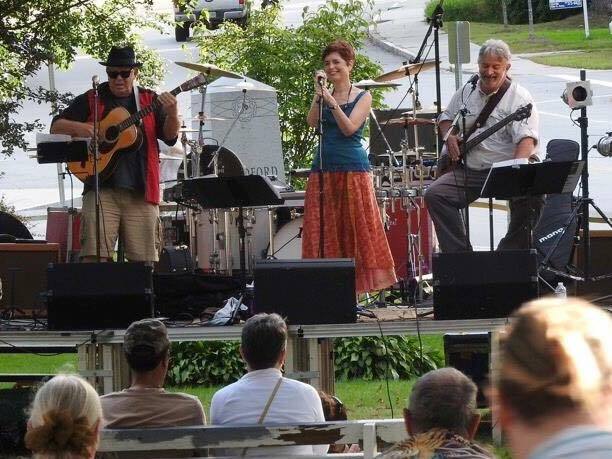 The Bob Kramer Trio regularly perform at a variety of venues in the area, including the Topsfield Fair, and Bob hosts the open mic at the Indo Pub, Beverly, on Monday nights. The band opened for national recording artists, Paul Rishell and Annie Raines at Beverly First Night and the Pete Best Band (original Beatles drummer) in Newburyport and the Terra Blues Club in the Village, NYC. Bob and Cynthia have both released solo CDs, Bob produced a compilation CD of Boston’s North Shore singer songwriters, North Shore Acoustic Project, which received a raving review in the Dirty Linen Magazine. He also received an Honorable Mention from the Billboard Magazine Songwriting Contest, and was the chair of the music committee for the Yankee Homecoming Festival in Newburyport, MA. His songs have been on radio playlists all over the world. Bob’s CD, Help me sing my song, is on the Oasis compilation CD Volume 5.